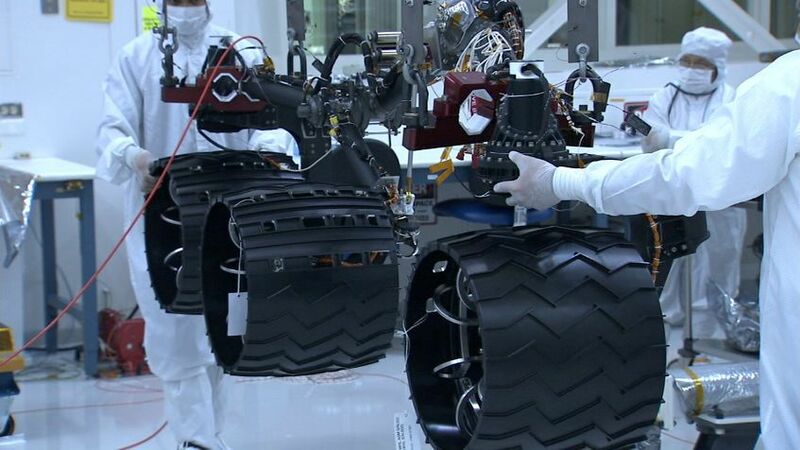 The Rover has a length of 3m and a weight of 900kg (1,984lbs). The science instruments weigh 80kg (176lbs). At the size of a compact car, it is the largest Mars Rover to date. Mission: “To search areas of Mars for past or present conditions favorable for life, and conditions capable of preserving a record of life. The Rover’s main structure is called the warm electronics box or WEB. It is the outer layer of the vehicle that provides structural integrity and protection against environmental loads. Inside the WEB are the electronics and computers of MSL. The Rover Equipment Deck is on top of the WEB. This triangular shaped plate is a platform for external instruments like the rover’s mast and High Gain Antenna. The Rover Computer is a part of the Rover Computing Unit that is the central computing component of the vehicle and is located inside the WEB and its stable environment. Communication interfaces enable the RCU to exchange data with the instruments and sensors. This industry standard interface Bus is used for communication and control of all rover motors, science instruments and other functions. 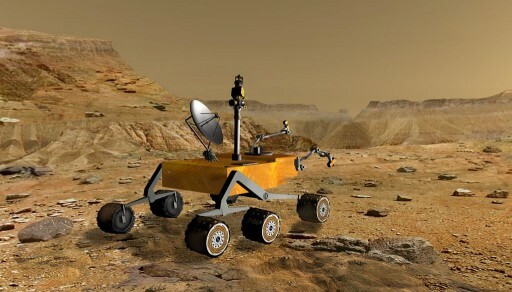 The On-Board Memory can tolerate the extreme radiation environment of space and it is protecting data in case of power-off cycles, so no data is erased when the Rover shuts down unexpectedly. 256MB of DRAM and 2GB of Flash Memory with error detection and correction are included in the system. Also, 256KB of EEPROM are available. This onboard memory system is 8 times as capable as the one used for the Mars Exploration Rovers. The Rover Computers are the prime health assessment system of the rover. They register all signs of health, temperature sensor readings and other properties that keep the rover alive like power generation and consumption. This control loop is constantly checking itself to make sure it is able to communicate and remains within thermal requirements. Temperatures are checked at chosen intervals to ensure the WEB remains in a stable condition. The system has the ability to autonomously respond to thermal events like overheating, record power generation and storage levels and prepare for communication passes. Rover Operations (taking pictures, driving, operating the science systems) are performed under commands that are transmitted in a command sequence that is developed by the flight team on Earth. Constant engineering, housekeeping and analysis telemetry feeds as well as periodic status reports are stored by the computer and are made available for downlink by the ground team. The computer system is fully redundant with one system being the prime computing unit and the other being asleep ready for activation should the prime string fail. One IMU is installed on the MSL rover. It will provide 3-axis information on the exact position and orientation of the vehicle. This system enables the Rover to make accurate vertical, horizontal and yaw movements. It is used to calculate the level of tilt the rover is experiencing on surface features. The IMU will support rover navigation in order to make safe traverses. 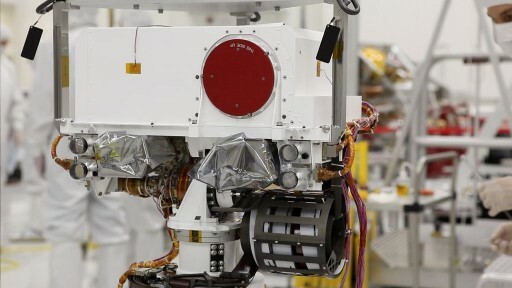 In addition to the science cameras (Mastcam, ChemCam, MARDI, MAHLI), several other cameras are installed on the rover that fulfill different purposes. Four Engineering Hazard Avoidance Cameras are installed on the lower portion of the front and rear end of the rover vehicle. These cameras will acquire black and white photography using visible light generating 3D pictures when processing the two frames. Imagery taken by the system will be used to safeguard against the rover getting lost or crashing into unexpected objects, Software automatically processes the imagery and makes safety decisions. Should a problem be identified, the rover will stop operations and the ground team will be given the opportunity to make a final decision after downlinking the stereo pair. Each camera has a field of view of 120°. 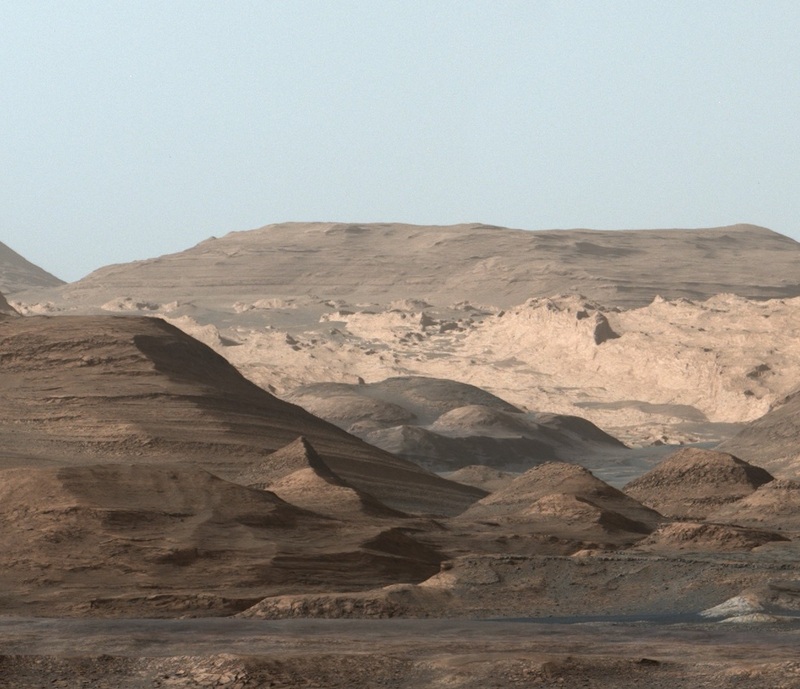 The image that is generated by the rover maps out the terrain in front of behind the rover as far as 3 meters. Two engineering cameras, called NavCams for Navigation Camera, are mounted on the vehicle. These cameras will gather black and white images of a panoramic nature. 3D images will be generated from the photography. Each camera has a field of view of 45°. NavCam footage will be used by ground engineers and scientists in order to navigate the rover from Earth. The system works in cooperation with the Hazard Avoidance Cameras providing a complementary view of the area that surrounds the rover. The robotic arm holds and maneuvers a turret that is mounted at the front end of it and holds the instruments and devices necessary to conduct contact science and acquire samples. 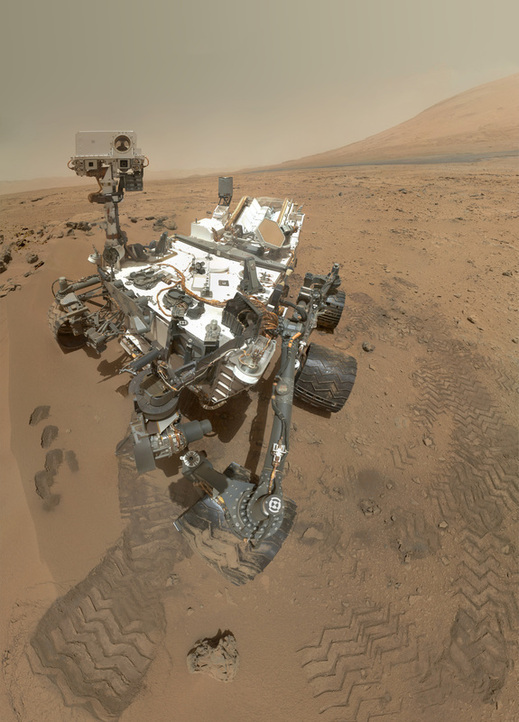 An extensive description of the Arm and its Operations can be found on the MSL Sampling Page. 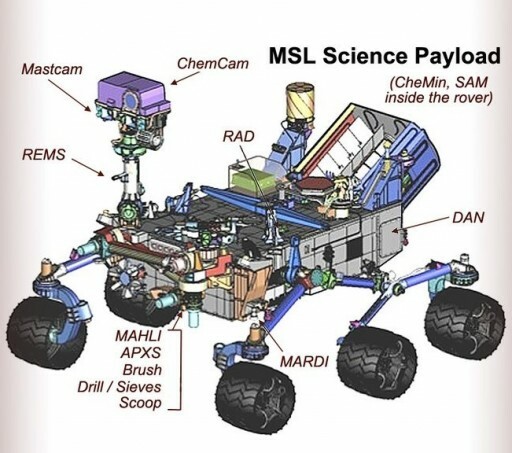 MSL has 6 individually controlled wheels. Each wheel has its own motor. The two front and rear wheels have individual steering motors allowing the rover to turn in place. 4-Wheel steering also enables the vehicle to make arching turns. Cleats on the wheels provide grip needed when climbing, translating through soft sand or scrambling over rocks. MSL includes a suspension system that keeps the rover body in balance at all times. The suspension system allows the rover to drive over rocky terrain without experiencing sudden changes in vehicle balance. hen one side of the rover goes up, the other sides goes down prompted by the suspension system to even out the weight distribution on all the wheels. A tilt angle of 45 degrees in any given direction could be supported by the rover, however the mission design places the upper limit for rover tilting at 30°. The suspension system allows the rover to go over obstacles or through holes that are larger than a wheel diameter (50cm). At top speed, the rover will be going 4cm per second. 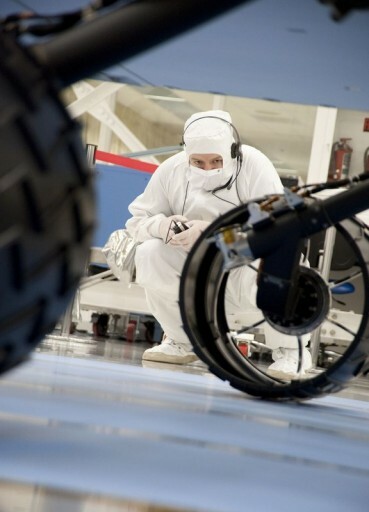 MSL is equipped with a High Gain Antenna and a Low Gain Antenna that are both located on the Rover Equipment Deck. The low gain antenna is omni-directional – it sends and receives data in every direction. Radio Waves at a low rate are transmitted by the LGA. The Deep Space Network on Earth receives that data. The HGA needs to be pointed as it sends a focused radio signal in a specific direction. It is steerable and points itself to any chosen DSN antenna on Earth. The MSL rover does not need to move to make contact with Earth as the antenna provides a certain amount of range capabilities. 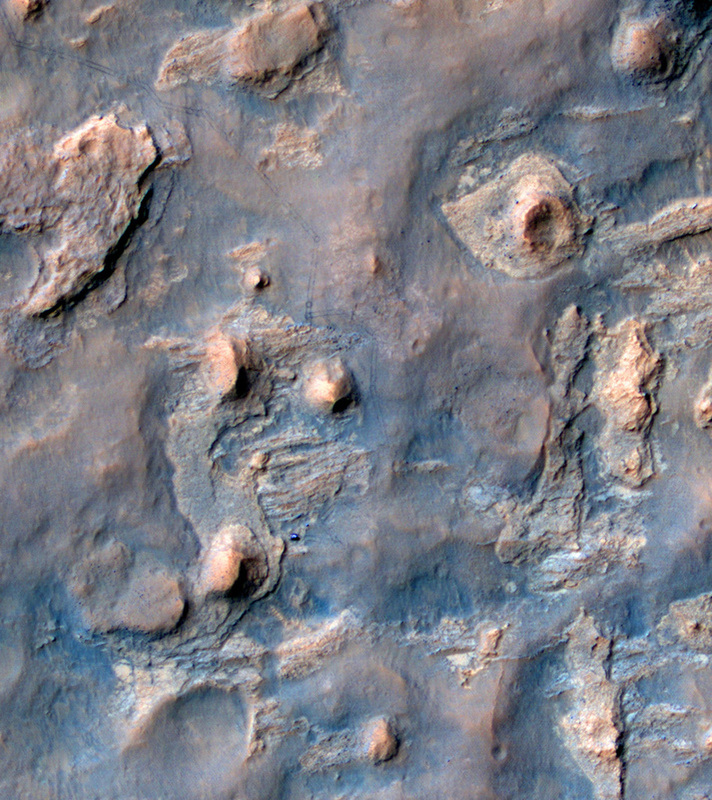 MSL will send and receive information directly from Earth. Also, it will use the Mars Reconnaissance Orbiter and the Odyssey Orbiter as Communication Assets. MRO/Odyssey will receive data from MSL that is then transmitted to Earth on the next communication pass. 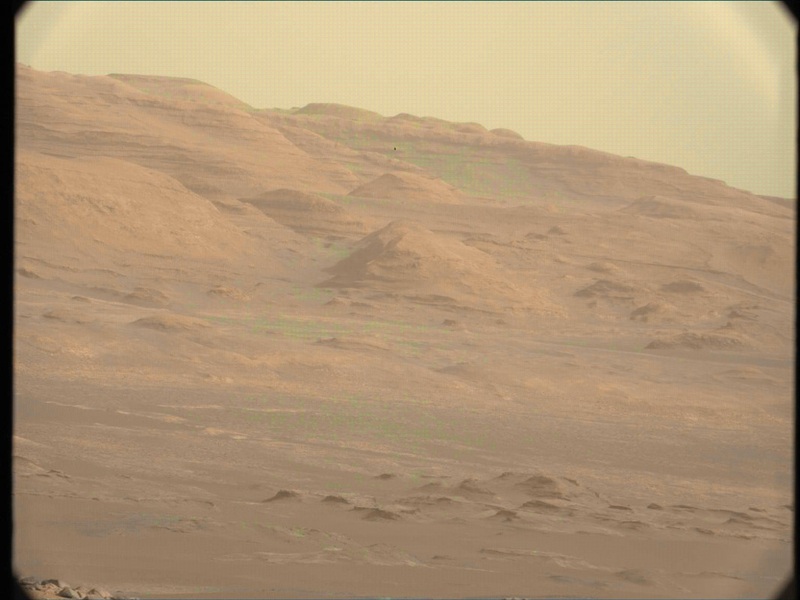 In addition to that, MRO/Odyssey will get data for MSL from a DSN Antenna which is then relayed to the rover. The advantage of this communication technique is that the orbiting spaceraft are much closer to the vehicle on Mars than the DSN on Earth. Also, the orbiters have much longer communication windows with Earth. For this communication technique, UHF antannas on the Orbiter will be utilized. The MSL rover also includes one UHF Antenna on the rover deck to talk to MRO. Another factor are data rates. When communicating directly Earth, Uplink/Downlink data rates are between 500 Bits per second and 32,000 Bits per second. When the Rover is connected to an orbiter, data rates of up to 2 Million Bits per second for MRO and 128,000 or 256,000 Bits per second for Odyssey. During daily Orbiter passes of 8 Minutes, 250 megabits of data can be exchanged. Data rates from the orbiters to Earth are also fairly high as the orbiting spacecraft have a larger power capability and much bigger antennas. MSL will have Communication passes with Earth for several hours per sol exchanging data mainly before beginning operations and after the sol’s activities have concluded. 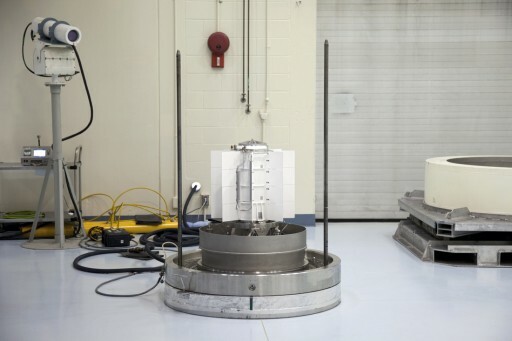 To generate power, MSL carries a Multi-Mission Radioisotope Thermoelectric Generator that provides electricity from the heat of Plutonium’s radioactive decay. The MMRTG converts the heat emitted by naturally decaying materials into electricity. The system consists of a heat source that contains Plutonium-238 Dioxide and a set of solid-state thermocouplers that convert the energy into electricity. Eight General Purpose Heat Source Modules containing a total of 4.8kg Plutonium Dioxide that initially produces 2,000 Watts of thermal power and 120W of electrical power after conversion. The MMRTG is 64cm in diameter and 66cm in length. Its total weight is 45kg. It will provide power for the primary MSL Mission of at least one Mars Year (687 Days on Earth), however MMRTGs are built to provide power for ~14 years. Also, the heat produced by the MMRTG is used to heat the vehicle and its system to avoid thermal limit violation. In Martian Winter, more energy will be needed to keep the vehicle warm so that electricity levels decrease during that period causing science time to be lost as well.